If you know anything about my eating habits, you probably know that it’s quite difficult to find me, without a box, heck, an entire House of Cards season-worth stash of Grape-Nuts. I mix them into smoothies; sprinkle cinnamon and flaxseed over them with a handful of berries and call it breakfast; and I get weird looks when I drizzle a half cup over fried bananas as my go-to late night snack. Needless to say, when Post Cereal shared this recipe with me for my blog from Kristina Vanni, I knew my quest for the perfect snack bar had ended. Behold! 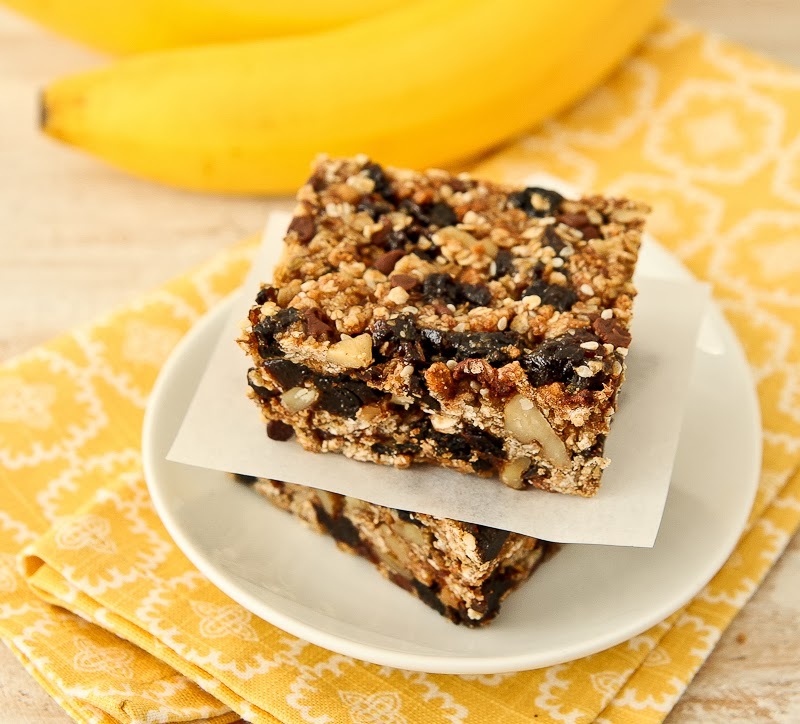 Trust me when I say these energy bars will give you that jolt to make it through the morning grind or a pick-me-up come that 3:00pm hey-why-isn’t-it-nap-time o’clock. National Nutrition Month never tasted so good. Heat oven to 325 degrees. Line an 8-inch square pan with nonstick aluminum foil making extended edges, or can use regular foil and coat with cooking spray; set aside. In large bowl of electric mixer, combine oats, Grape Nuts, flours, flaxseed, cinnamon, and salt; stir to combine. Add flax egg, banana, honey, brown sugar, oil, and vanilla; mix well. Stir in chopped prunes, walnuts, chocolate chips, and sesame seeds. Mix well to combine; dough will be stiff. Transfer to prepared baking pan and pat in mixture evenly. Bake for 30-35 minutes until edges are browned. Cool completely on wire rack in pan. Use edges of foil to pick up and flip out onto a cutting board and cut into 24 squares. P.S. Hate prunes? Swap ’em for dried apricots! Got pumpkin seeds? Throw ’em in. How about some leftover shredded coconut you’re looking to kill? In they go! Feel free to experiment with your mix-ins and flavor the bars to your own personal taste. For more great recipes check out www.Grape-Nuts.com or www.Facebook.com/GrapeNutsCereal.